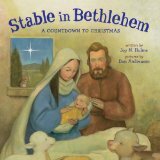 A stable in Bethlehem is the location of the very first Christmas, as the holy family receives the baby, Jesus, into the world. Children can experience this gift through Stable in Bethlehem. In this board book, the author counts down those present at the birth, from twelve doves down to two parents and one baby. All of these animals, people and angels come to worship Jesus, born to Mary and Joseph. Christmas is a magical time of year for children, but they often forget the meaning of the season behind the glitter and gift-giving. This sweet and simple story reminds them of the real reason we celebrate Christmas.